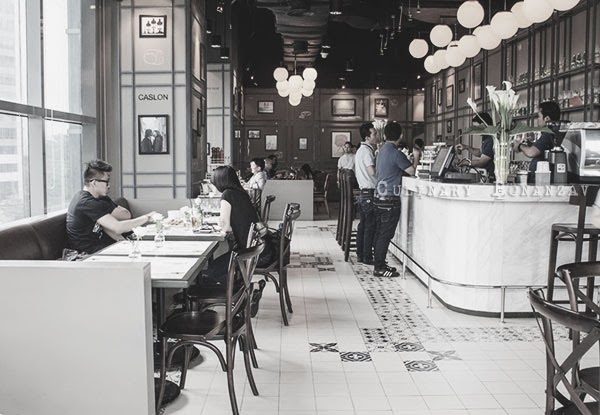 No one would've guessed that a chic French Brasserie would be tucked in one of the corners of a multi-storey French-based department store, Galeries Lafayette at Pacific Place mall. 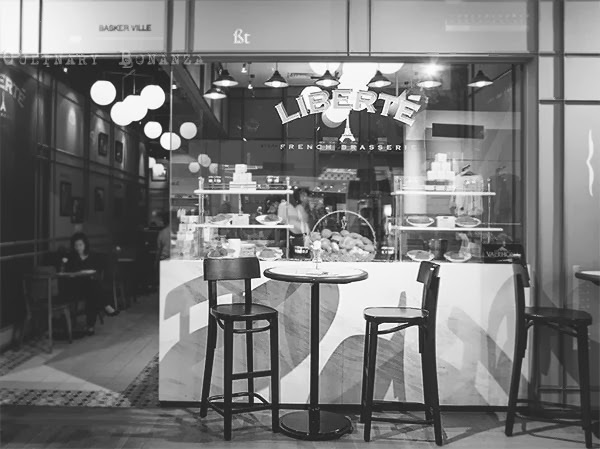 In the jungle of all the pretty products and foreign labels, there lies Liberté French Brasserie, a cosy spot where shoppers could stop by to sip une tasse de cafe with freshly baked French pastry or savour the main course and refill the energy before getting back in the hunting games at the luxurious store. 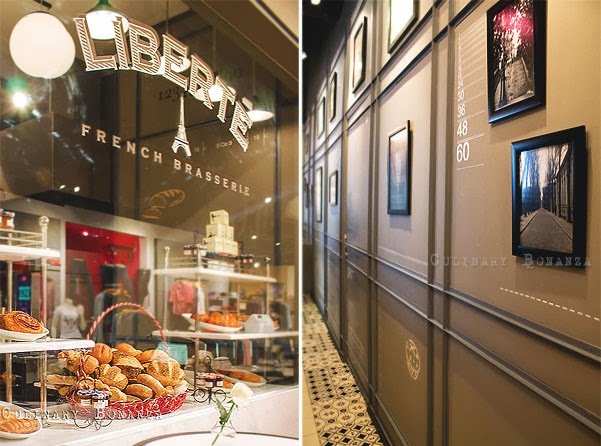 From the outside, you might think it is a bakery, because of the delectable looking French pastries on display behind the glass. If it weren't for the air conditioning, and the clothes and mannequins around, I would be tricked into thinking that it was just like any other street-side brasseries in France, like the ones I've seen in movies and imagined in my mind. You can find exquisite Valrhona bon bons as well as their home made pretty macarons on display, inviting sweet tooths like me to drool at the dessert display. 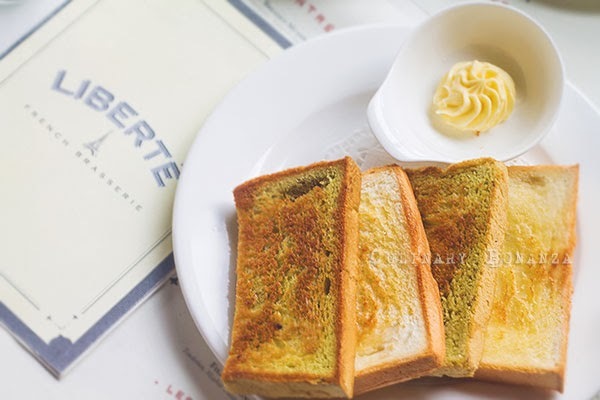 Every guests are treated to a platter of complimentary toast (plain and pandan toast) and a dollop of beurre blanc (plain butter). Couldn't be a better way to start the meal! 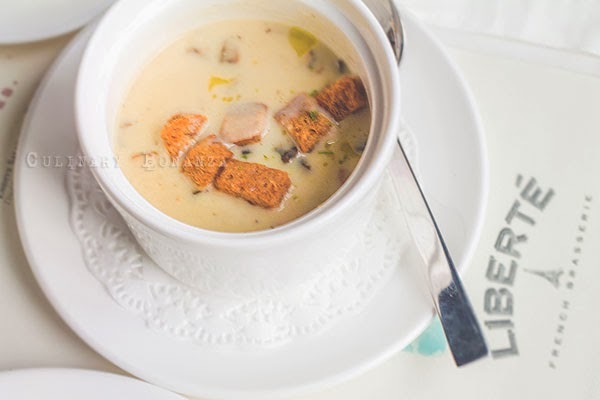 Creme de Champignon - Cream of mushroom soup served with croutons and cream foam. You might be surprised to see the price, but the serving is actually quite big, if it were me, I'd be able to have it as my main course. Salmon en Croute - tender and juicy salmon in crispy puff pastry with cream cheese and beurre blanc. I just can't forget the intoxicating buttery scent that caressed my nose as I cut the salmon-filled pastry in two. The pastry was light and crispy and most impressive is the well cooked salmon, not overcooked, just right, still moist and tender. Glad that I made the right choice. Chicken Roulade - chicken breast, mashed potatoes, tomato confit. Didn't get to taste it because my friend was too stingy. LOL..kidding! 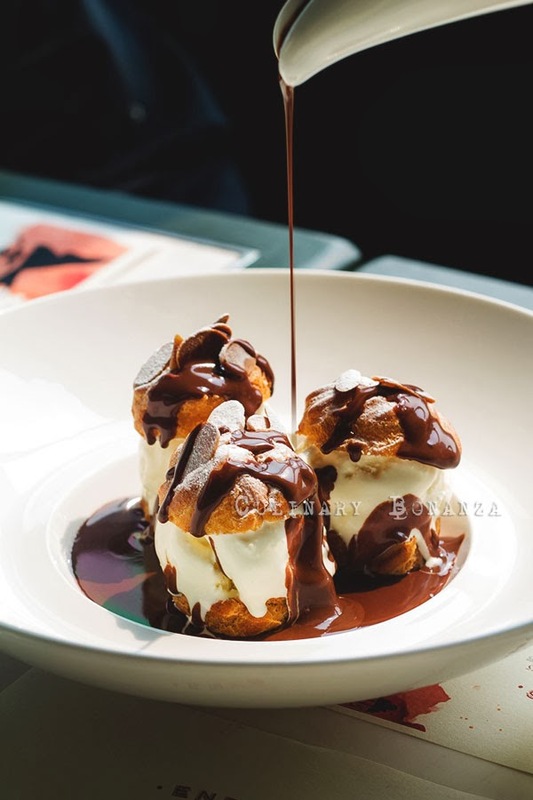 Profiteroles - 3 pieces of almond profiteroles, vanilla ice cream and chocolate 'soup'. Just look at the glorious chocolate soup flowing from its container. 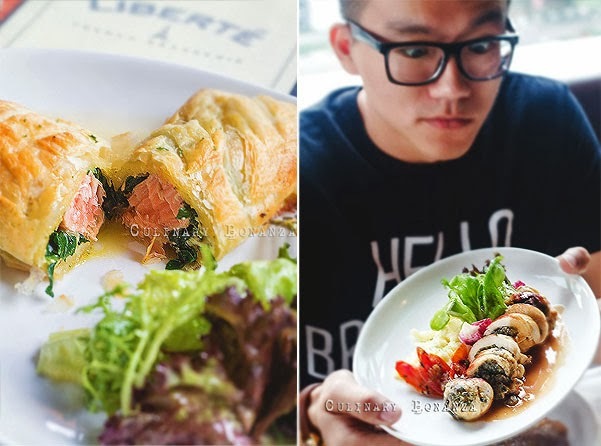 What I love about Liberté's version is the generous and tasty chocolate sauce, as in they don't use the bottled sauce (you know which brand I'm referring to). Even though it could try to make the sauce less sweet with richer chocolate. But I could do with this. Other than the profiteroles, I saw some interesting dessert on the menu, such as Mille Feuille (puff pastry, white chocolate chantilly & berries) and Passionfruit Crème Brûlée. 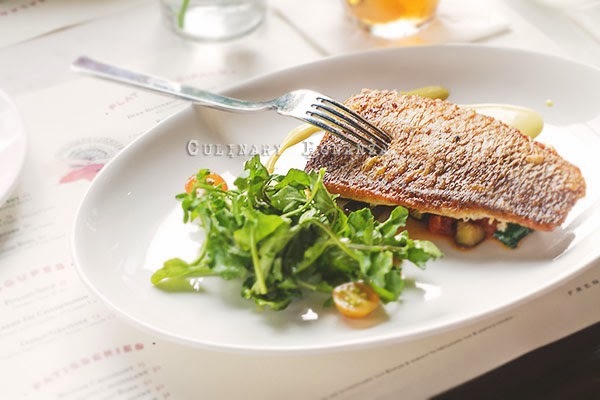 Make your reservation via Qraved, it's quick & easy!